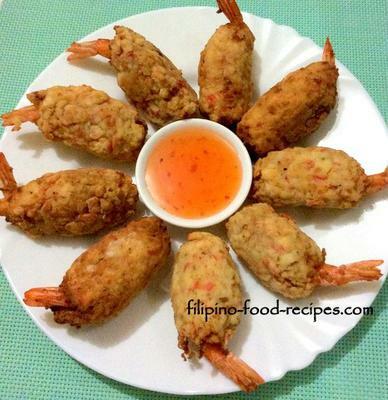 The Shrimp and Crab fries dish is what we Filipinos call crab omelette where the crab mixture envelopes the shrimp, and then fried. To call it Shrimp and Crab Omelette is actually a misnomer as omelettes are usually folded scrambled eggs with fillings inside. I first tried this dish about 20 years ago when I was first dating my wife -- we had it at a fastfood restaurant at a mall in Quezon City . It must be a popular seafood dish there because they still serve it after all these years. Try it and let me know. It is perfect with sweet chili dipping sauce. 1. Peel the shrimp, devein, leave the tail intact. Make few slits on the underside to make the shrimp straight and not curl up. 2. Mix the crabmeat, breadcrumbs, eggs, onion, salt and pepper. 3. Scooping 2 tablespoon of the crabmeat mixture, wrap around the shrimp leaving the tail exposed. 4. Refrigerate for an hour to set. 5. Deep fry in medium heat until golden brown. 6. 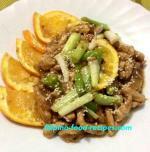 Serve with sweet chili sauce.